This coast artillery battery was one of five used during the First World War to defend the important port and ship-building centre on the Clyde. Accounts differ as to when, during the first decade of the 20th century, work had begun to remodel the existing battery to mount two 4.7-inch QF guns. QF guns were intended to tackle smaller, faster-moving attacking vessels. They achieved their high rates of fire (5-6 rounds a minute, firing a 20kg projectile) because the propellant and the explosive shell were contained within a single piece, rather than for larger guns, whose propellant and shell were loaded separately. The battery was also equipped with two .303 calibre Hotchkiss machine guns, mounted to the east and west of the main armament. A War Department record plan of the battery, dated 1906, states that work had begun on the battery on 17 March 1902, and had been completed by 31 December 1905, at a cost £4623 (almost £0.5M at 2013 values), the guns apparently having been mounted in July 1905. The record drawings show the gun emplacements, magazines, barracks, offices and domestic buildings in detail. The top of the magazine was protected by 5ft 4in of concrete with 3ft 6in sand and 6in fine earth above. The Fortress Record Book records that the pair of guns installed in 1905 was replaced in 1912, and in 1913 shelters were built for the gunners on the battery. There were two Defence Electric Lights (large searchlights) at Fort Matilda, which were to illuminate targets on the river at night. The wartime garrison of the fort numbered about 200: there were about 130 artillerymen and officers; 10 Royal Engineers and 52 Electrical Engineers, mainly to man and maintain the searchlights. About 160 men (and the wives of many) could be accommodated within the fort. There was also a full battalion of infantry (over 1000 officers and men) to defend the battery, accommodated in camps nearby. These men both guarded the fort and its immediate environs, and defended Lyle Hill (NS27NE 40.02-4), which dominated the fort from the south. Lyle Hill was also the site of one of the battery’s two anti-aircraft guns (see NS27NE 40.01) (and an AA searchlight), the other was within the Fort. War Office maps dated 1916 show the locations of the defences of the battery, including Lyles Hill. The defences on Lyle Hill were very strong: A system of trenches, linking three blockhouses (pillboxes) surrounded the summit. with an apron of barbed about 100m in front of it. Machine guns were placed on the east and west sides, and the anti-aircraft gun at the northernmost end of the complex. Further defences were built to the south-west and west of Fort Matilda, and the torpedo factory immediately to the west of the Fort. The fort had two anti-aircraft guns, one on Lyle Hill and one marked on a plan on file WO 78/4396, on the Esplanade, just to the east of the fort. The two 4.7-inch guns were removed in February 1917, to be used to arm merchant ships, and the battery was decommissioned. The battery’s searchlights remained in position, although mainly for training, until about 1937. Nothing now survives of the battery or the defences on Lyles Hill. Information from HS/RCAHMS World War One Audit Project (GJB) 1 July 2013. Constructed in 1815 on land gifted to the War Department. 1901 rebuilt to accept 2 4.7-inch guns (see NS27NE 96). 1817 guns dismounted but site remains Head Quarters of commader of Clyde Defences. In World War II continues as HQ Clyde Defences. Abandoned in the late 1940's. J Dorman and J Guy 2010. This now demolished First World War coastal battery was situated immediately S of Whiteforeland Point. The gun-emplacements have been cleared away and the site is now being used by the Coast Guard School. A World War II Submarine Mining Station (NS27NE 97) also occupied the site and some buildings from this period are still extant. The battery was armed with 2 4.7-inch QF (Quick firing) VB/V guns in 1904 and these had been removed before 1928. (Information from PRO duocument WO/192/102). J Guy 2001; NMRS MS 810/11, Part 2, 82-3. "A Sketch of Part of River Clyde showing situation of a Battery on White Tarland Point"
It gives a plan of the Battery to a scale of 1 Scotch Chain to an Inch, and Plans, Sections and Elevations to a scale of 10 Feet to an Inch of Guard House. Dated R.E.Office, Edinburgh, 10 September, 1813, and docketted as "Drawn to accompany Major Smyth's Report to Lt. General Mann dated 11th September 1813". The drawing is coloured. 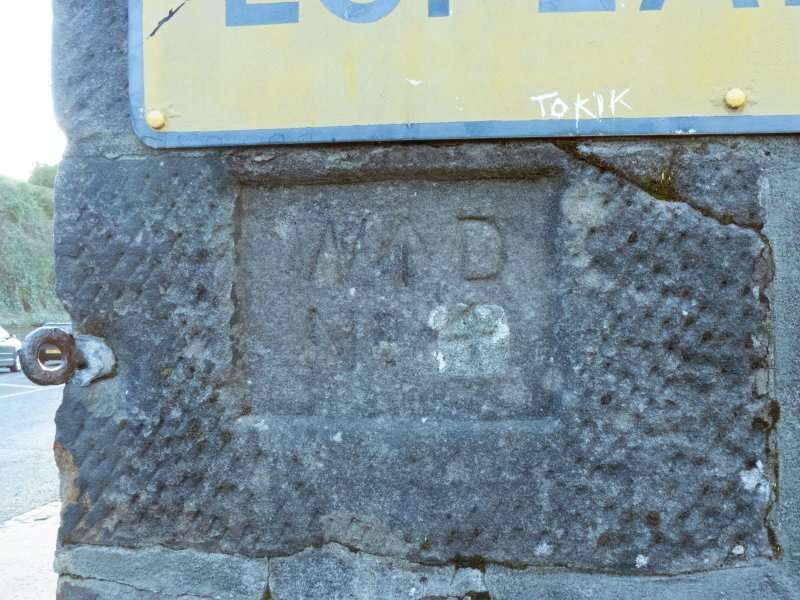 This probably refers to what was later known as Fort Matilda. First World War coastal battery was previously recorded as NS27NE 96. 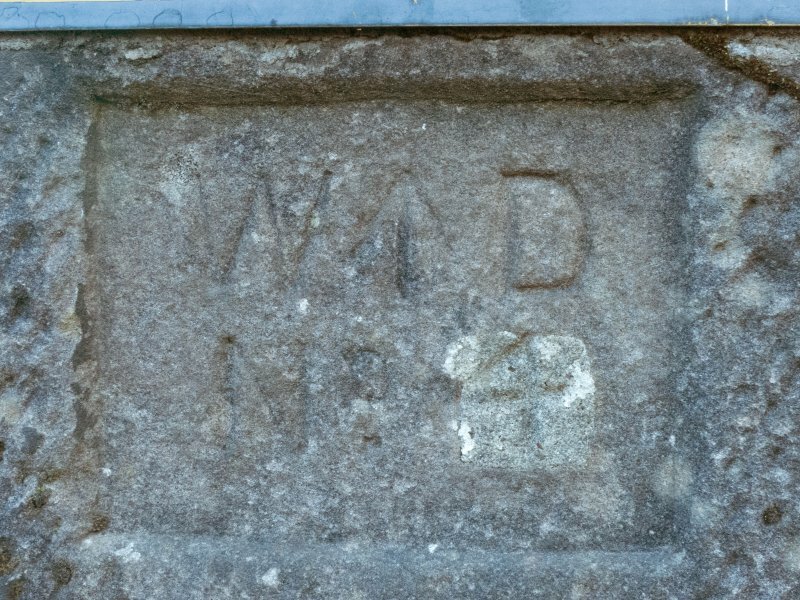 Two boundary stones respectively mark the SW and SE corners of the former War Department property at Fort Matilda. That at the SW corner (NS 25800 77860) has been set (at a height of 1.23m above street level) into the south face of a stone wall on the north side of Eldon Street. 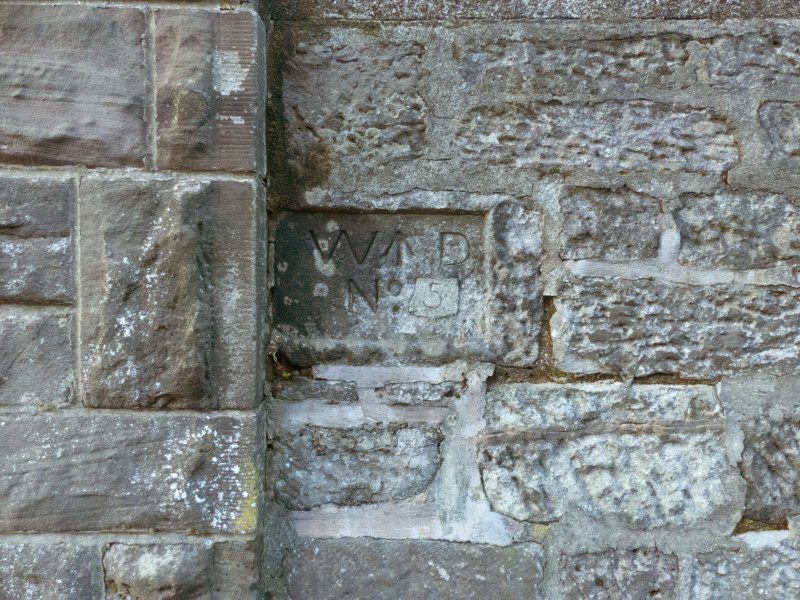 The hammer dressed stone measures 0.43m in width by 0.25m in height and contains a recessed panel bearing the incised letters ‘W’ and ‘D’ which flank an upward pointing arrow above ‘No. 5’. This number has been incised into what is clearly a cement patch and is therefore secondary. The stone at the SE corner (NS 25857 77865) has been set (at a height of 1m above street level) into the east face of a stone wall at the junction of Esplanade and Eldon Street. It measures 0.55m wide by 0.31m high and 0.22m deep, and has a stugged/dabbed surface. 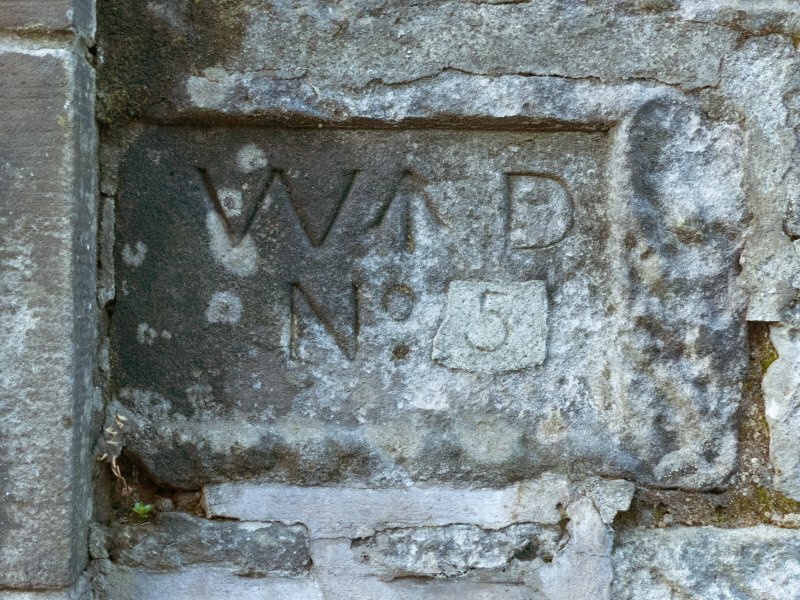 A shallow recessed panel bears the incised letters ‘W’ and ‘D’ which flank an upward pointing arrow above ‘No. 4’. This number is also secondary. Both boundary stones are depicted on an 1895 plan of Fort Matilda (National Archives: WO78_2443_03) and they are also shown on the 2nd edition of the OS 25-inch map (Renfrewshire, 1897, sheet II.1). At that time the sequence of markers ran clockwise around the property starting with ‘No. 1’ at the SW corner and ending with No. 10 at the SE corner. However, the 1940 edition of the OS 25-inch map (Renfrewshire 1940, Sheet 002.01) shows that by this time the location and numbering of the boundary stones had been revised, with the new sequence starting in the NE corner, close to the south end of the pier, and running clockwise. This saw stone No. 1 changed to No. 5 and stone 10 changed to No. 4. Visited by HES Survey & Recording (AM, AK) 3 March 2016.